From an academic angle, I think this is a very good program. 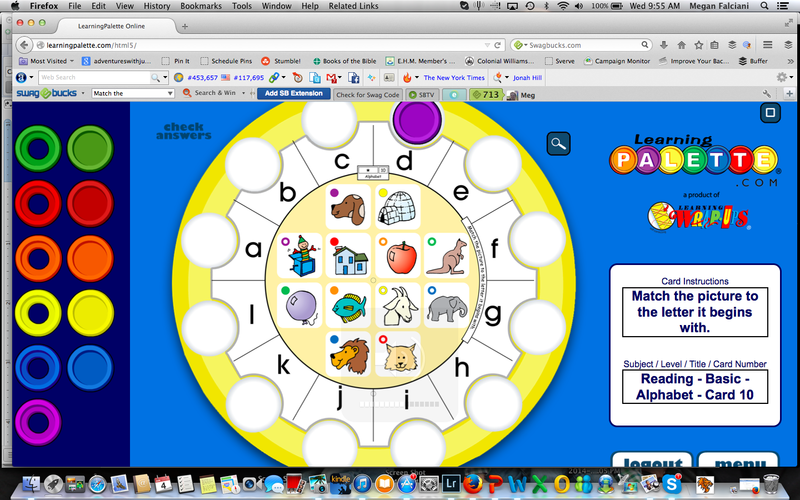 The online series contains two sections - Language Arts and Math, and each subject is divided into different levels. The divisions are pretty logical (generally by expectations for that grade), and you can move around within the level/activities. I also like that you can do different levels within the program. 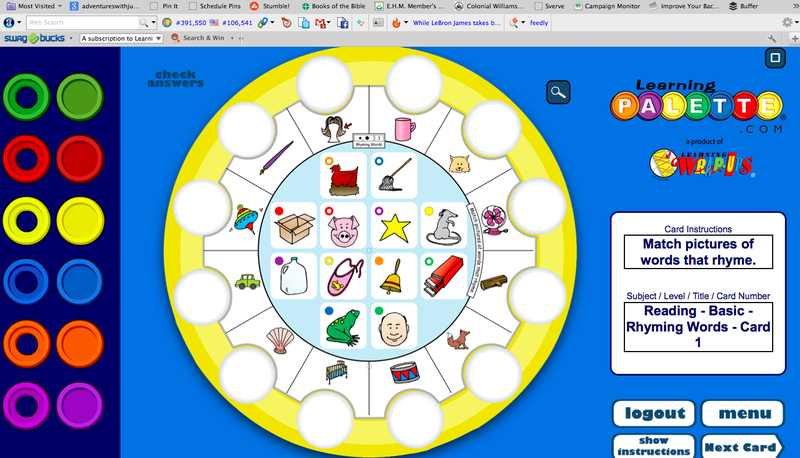 For example, Jude easily completed the Level 1 math activities, and then started in on Level 2. However, because his language skills are far behind his math abilities, so it was good to be able to start in the Basic level cards for those. The some of the Basic level skills for language arts corresponded with some of the things we have on our "Speech Therapy" activities summer/home program list - matching pictures with sounds, rhyming, etc. I foresee us using the language side of the program more as a "speech therapy" activity, rather than an actual "school" activity. Damien started with Basic levels, and did OK with a few activities. He didn't get much beyond "Match the Letters" in language arts or matching colors & shapes for math. I'm ok with that, given he's only almost 4, however, unless you have a really advanced kid, I wouldn't start this earlier than the "manufacturer's suggested age" of Kindergarten. Schools have been using the Learning Palette program for a long time for independent learning centers, and I agree with this practice. 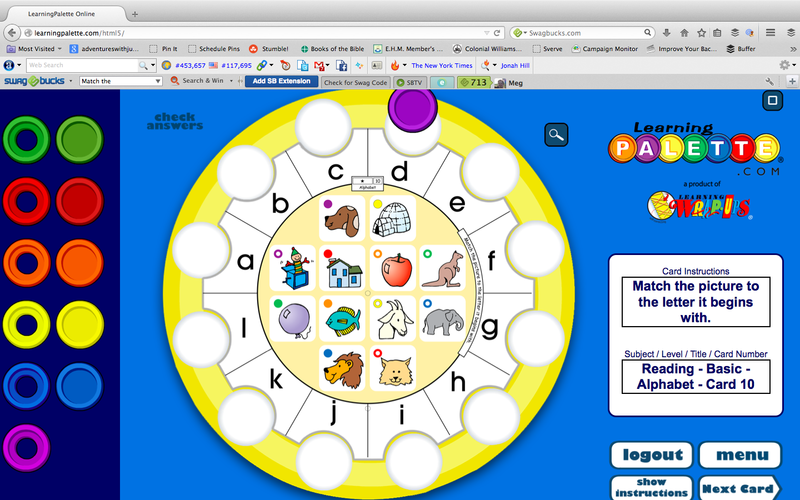 It's really more of a review/drill game, and less of a learning activity -- if the child doesn't know that the word jam starts with a /j/ sound, which is written as the letter j, it's not going to be an independent program. I think if the boys were just reviewing and able to work on their own, this would have been easier. Damien even struggled with understanding the "split card" idea - where the colored rings made the top matches and the colored disks matched the bottom. I think because their skills are so limited, it was frustrating because they didn't have a lot of variety to work with, and both needed help figuring out even just how to get from card to card. For example, Jude eventually figured it out by where/what buttons he clicked on in the past, not by decoding that that shape he clicked said "Next Card." We had an opportunity to review the physical product but I decided to request only the online program. Given we spend a lot of time working away from home, I thought that the online version would suit us better because it was a lot less pieces to worry about losing in our travels. 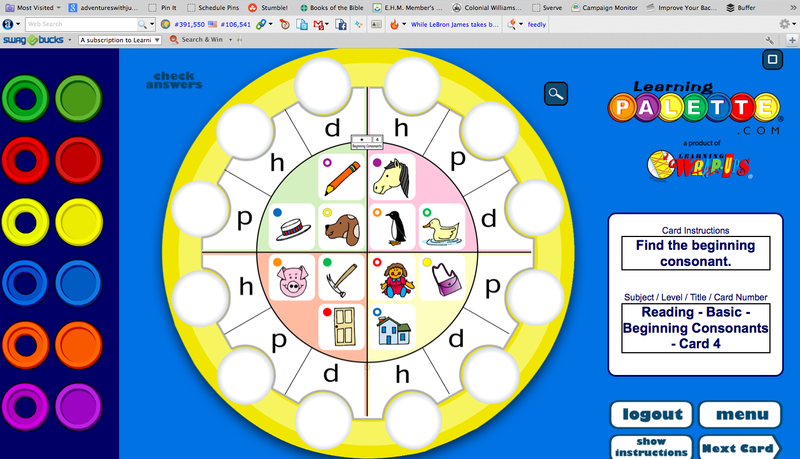 LearningPalette.com works on the HTML5 platform, so it can be used on a computer or tablet, or even an iPhone! (The last one is little small, but it will come up.) Having used it on both a MacBook and iPad/iPad Mini, I am reconsidering the "it's a lot of pieces" stance. The trade off for having it online is having to drag the "chips" into place. 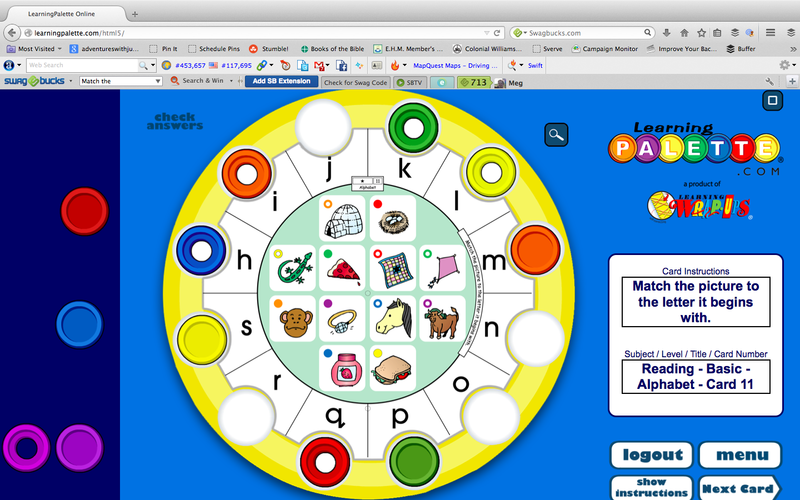 On the computer, if Jude resized the window mid-card (usually making it bigger so he could see the farthest top and bottom edges), he had to re-place the tokens. 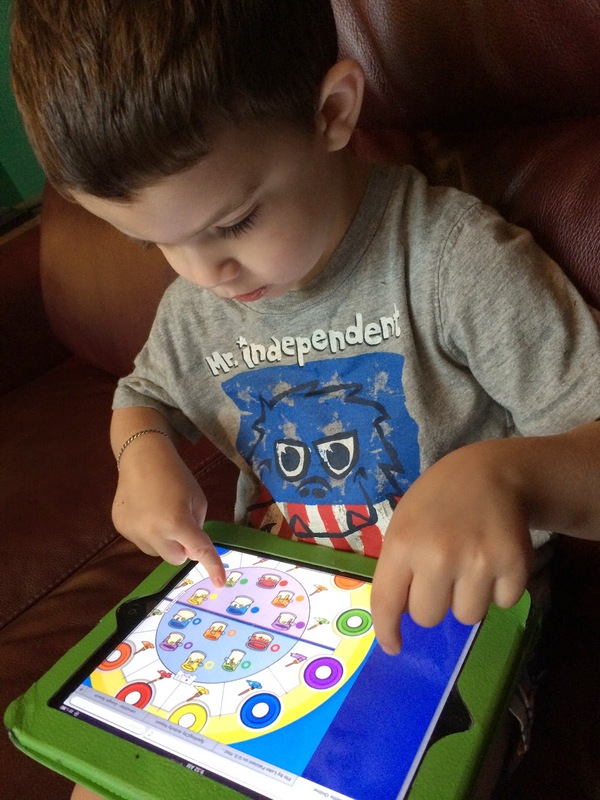 Jude also needs a lot of sensory input to maintain focus. 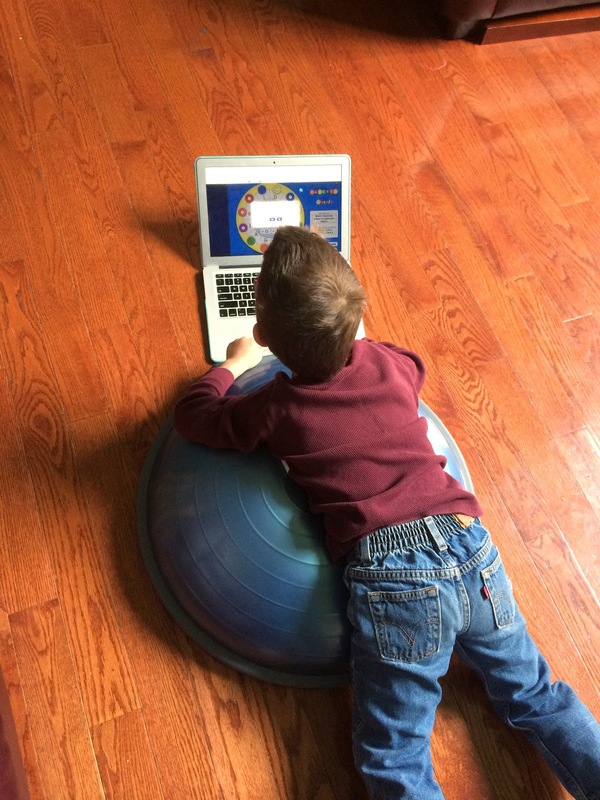 One day, we tried working draped over a Bosu ball. It was really awkward using the computer, and I think having the physical program would have helped with being able to position himself and the item, plus given him a broader range of movement (picking up chips and moving them to another space/into the palette) rather than having only a 4" x 3" trackpad to move only his finger. Overall, I liked the concept of the Learning Palette but the online version ultimately didn't suit our needs as well as I would have hoped. Since the boys will be in the age range for quite some time (math skills are covered through fifth grade, language arts to third), not counting therapeutic use, once our subscription runs out I may consider investing in the physical product. 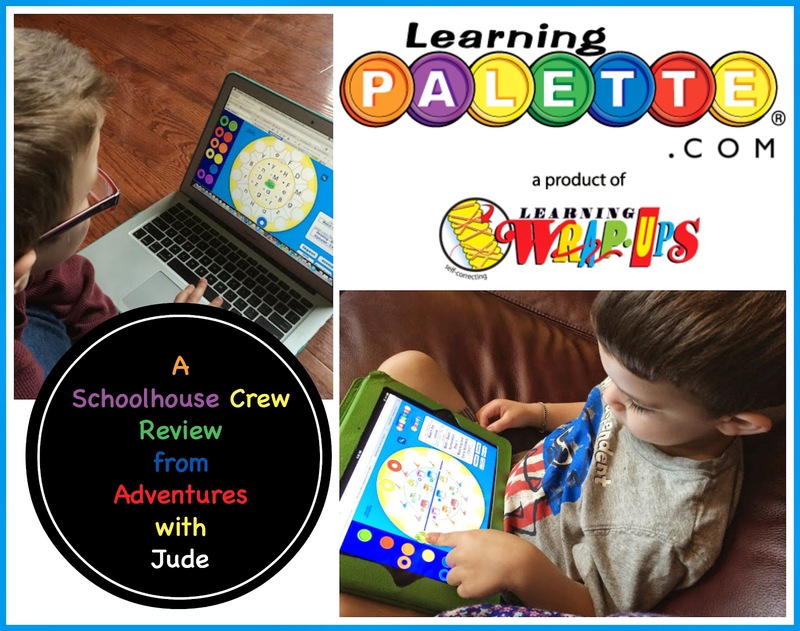 I'm definitely going to check out the reviews that other crew members did of the physical product Learning Wrap-ups activities - click the button below to join me! We have some of the physical learning palettes from way back when I sold Usborne Books, and I have liked them. They definitely are for kids who already know the skill and are practicing. But you're right that being able to physically move the tiles is good, and I think it would be difficult online.